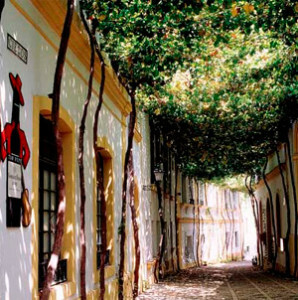 In 2016, for the first time in recent years, the Bodega Gonzales Byass is a venue for Festival de Jerez performances, as the makers of Tio Pepe have opened their halls to dancing and song. Situated close to the ancient Alcazar and the Cathedral of San Salvador, the Bodega covers several acres in the centre of Jerez town and includes a number of elegant nineteenth century bodega halls, including one designed by Gustav Eiffel. One week ago the bodega played host to two events, among others across the fortnight of the Festival. 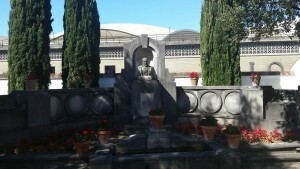 The first was a lunchtime promenade performance by Antonio El Pipa, the closest that flamenco has to royalty ( his entire family have been flamencistas, including his, very famous, Aunt Juana ). The second was an evening concert by Antonio Reyes (singer) and Diego del Morao (guitar). Your blogger and her party attended both. The first event was part of the special twentieth anniversary celebrations and there wasn’t much information available when we bought our tickets. So we didn’t know what to expect. 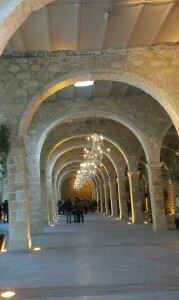 The concert took place in the long, grand hall called Los Gigantes (right) where sherry was, of course, on sale straight from the barrel. With others, we gravitated towards a small stage at one end of the grand hall, only to be surprised as the doors at the other end opened and a phalanx of red bolero’d dancers strode in. They took up position, each by one of the large supporting columns of the hall and proceeded to dance. This heralded the grand entrance of El Pipa who entered and danced, fluid and upright, along the main aisle of the hall to the stage. There a guitarist and a singer, Eva Rubichi ( see 2015 Festival de Jerez ) had slipped, unnoticed, on to the stage. The performance was a fine, if short, one and showcased El Pipa’s elegant and elastic, haughty style. Singer and guitarist performed until he returned for another short display, ( and in a change of clothes ) then the bolero’d dancers returned to accompany him back down the hall at its close. People milled around, drinking and talking in the grand space, unsure of whether or not there was more to come. We wandered out of the end of the hall, spirits and taste-buds gladdened, only to run into El Pipa having photos taken with the bolero’d dancers, who seemed to be employees of Gonzales Byass. We were back that evening, entering by a different gate and walking down a vine-covered street to Los Apostoles, one of the oldest bodega halls. This was laid out with a traditional stage, but with tables and chairs for the audience and the ubiquitous beverage on sale. This time, conscious of the dinner engagement to come, we declined. The line-up, of a singer, a guitarist and three palmists, was a traditional one and so was the programme. But the musical treatment, especially by Reyes, who is from Chiclana, just along the coast, was less so. He has a beautiful, controlled and gentle voice, even when singing at full pelt. There is a softness and fluidity to it which is unusual in male flamenco singers. His rendition of the traditional songs was very fine and much appreciated by the capacity crowd. It is to be hoped that the Bodega continues to use its grand old spaces for more performances in future. The official videos of both performances can be found here. This entry was posted in Culture Vulture, From a Foreign Field and tagged Foreign field by juliej. Bookmark the permalink. Yes. Great venues – especially the Concha ( pity I missed that one ). I didn’t mean to suggest that these were the only two performances in Gonzales Byass this year. Apologies if the article was misleading, I’ll take a look and change it. Shame I didn’t get to go to those you mention as well. Maybe cloning is the answer ( but not sure the world is ready for more than one of me, my family certainly isn’t ). Will you be going to the Festival again next year?